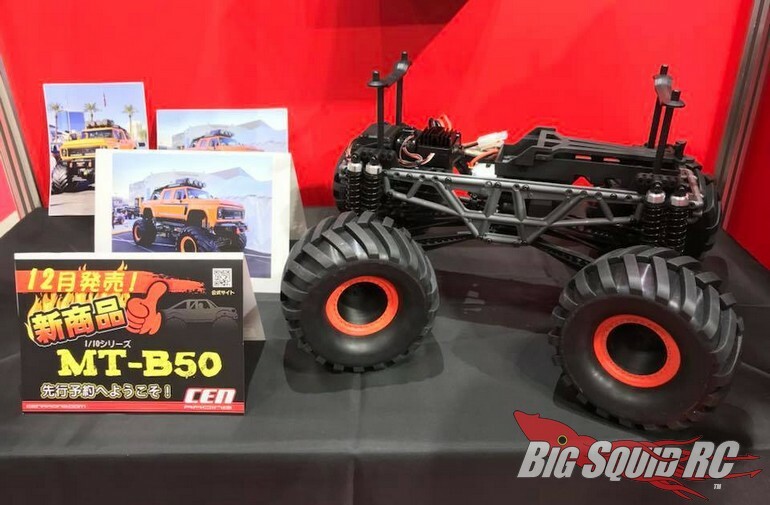 Monster Truck Madness – Let’s talk about the CEN Racing MT-B50 « Big Squid RC – RC Car and Truck News, Reviews, Videos, and More! Hello everyone, welcome to Monster Truck Madness! This week I want to touch on the CEN Racing MT-B50, which was announced about 3 weeks ago. I’ve been meaning to make it a topic of conversation here, it’s just that other things kept getting in the way. That changes this week so let’s gab, shall we? The MT-B50 is a solid axle monster truck, so let’s start there – with the axles. They feature center pumpkins. That’s a big plus for me. Hey, I LOVE my Axial SMT10’s, but I’m not huge on off-set diffs in a monster truck. The pictures also show what looks to be a one piece housing construction. I like it. The chassis is a twin plate design that mimics the optics of a triangulated tube suspension with a center transmission skid and top platform for the battery and electronics holding it together. When eyeballing it, the center of gravity looks sort of high but that’s hard to say without knowing the weight of any components. The rig has two shocks at each corner, so here’s to hoping the suspension is nice and plush! The size of the truck is a tad mysterious. While details are scarce, CEN did say the wheelbase was listed at 275mm. That’s pretty short, which tells me the rig will probably be on the smaller side like the MST MTX-1 versus a larger truck like the SMT10 or Clod Buster. It’s hard to make out in the picture, but it looks like the servo is on the front axle. That’s good, methinks. What’s potentially not good is that I can’t make out any sway bars. Let’s hope they are tucked away somewhere in there! As a brief aside, the look of this truck was actually done up by a good friend of mine. Michael Arndt, of Michael Arndt Designs, is a fellow r/c monster trucker that I regularly race with. He does a lot of logo and paint scheme work for various 1:1 monster truck teams. If you casually follow the monster truck circuit, you’ve seen several of his designs in action. Anyhoo, he did the original rendering for the MT-B50, which he was kind enough to send to me to post here. As you can see, the final product looks very similar! Here’s the thing, I have no experience with this brand so I’m REALLY taking some shots in the dark here based on a few pictures. Regardless of how the final product turns out though, it’s awesome to see a company release ANY kind of solid axle monster truck, so kudos to CEN Racing. I’m looking forward to trying it out.